Hello!! !I know I've been a bit out of it this week, but normality should be resuming for the first half of next week. Firstly, as you may know, Thursday is Remembrance Day, with next Sunday being Remembrance Sunday. I absolutely love how I'm seeing Poppies everywhere. I do go through mine quickly, and usually buy a few everywhere as I keep losing them. But this year, Kleshna has come up with some gorgeous poppies, that have also been spotted on the X Factor, and all proceeds go to The Royal British Legion. 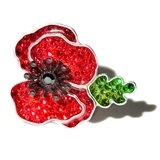 You can either get a Swarovski poppy, or opt for a smalled poppy, which is only £10! Clothing at Tesco are also getting into the Christmas spirit. They'll be launching a Facebook Application on their Facebook page, on the 15th November. All you have to do is become a fan and enter your email address. And the prizes are suppossed to be pretty awesome. Finally, the lovely girls at Wardrobe are running a pretty cool competition. They are giving you a chance to win £30 to spend at Accessories Online. Check it out here. P.S. Need major advce from any of you that use Blogger. For some reason, I can't upload any more pictures as I've used the free 1GB that we're entitled to. Apparently, I have to buy more storage space if I want to upload any more pictures. Have any of you had this issue before, or is there another way around it? I think I saw Davina wearing one on the million pound drop last night! Someone at work told me they were dead expensive, but at £10 that sounds great! congrats on your listing btw, and thank you for the lovely comment! you have a nice blog. I hope you visit mine. Follow if you wish and I' ll return the favor. Hope you find help regarding your photos.